Note: This is a guest post from GBA Events Asia. In our hectic days of juggling between work and home, we sometimes forget the essence of family time. Take a breather during the holiday weekend and bring your whole family to a classic Easter fair. 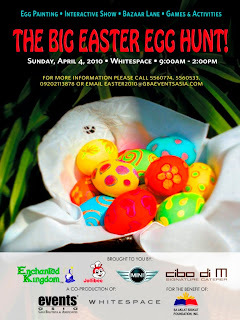 On Sunday, April 4, 9:00am-2:00pm, take part in The Big Easter Egg Hunt at Whitespace. Located at 2314 Chino Roces Avenue Extension (formerly Pasong Tamo Extension) in Makati, Whitespace will transform into a captivating Easter wonderland replete with a delightful Easter Brunch by Cibo d’M, an interactive storytelling musicale by Clowning Around, and not one but two Amazing Easter Egg Hunts. Kids will take part in Egg-and-Spoon Races and vie for the Treasure Chest of Gold Chocolate Coins at the Egg Painting Competition. At Enchanted Kingdom’s Easter Playground, everyone can snuggle up with the lovable Wizard and Princess Victoria. More fascinating activities and photo opportunities await kids at Jollibee’s interactive Jollitown. Daddies who wish to take it easy will cozy up with doughnuts and coffee at the Krispy Kreme Lounge, while Mommies will be delighted with their fabulous finds at the Kiddie Bazaar Lane. There will be loads of goodies to please every type of foody. And for the dynamic guests, there will be awesome Minis to test drive. Even dog-lovers will enjoy chilling-out with their pets at the Urban Doggies’ Spa and Lounge. Kids will surely head home with plump goody bags and heaps of memorable experiences. The Big Easter Egg Hunt is presented by Whitespace and GBA Events Asia in partnership with Enchanted Kingdom, Jollibee, Mini Philippines, and Cibo d’M Signature Caterer for the benefit of the Sa Aklat Sisikat Foundation. Tickets now on sale at Whitespace and GBA Events Asia: Penthouse Unit 7 Manila Bank Building 6772 Ayala Avenue Makati City. Call 556 0774, 556 0533, 0920 211 3878 for free ticket deliveries within Makati City. If you’d like more information about this topic, please contact Ms Kassy Pajarillo, Event Coordinator, at 556 0774, 556 0533, 0915 316 2252, mktpajarillo@gbaeventsasia.com.